Our MERS-centric Monday continues with yet another announcement from an Omani Ministry following the update this morning that 5 people have been infected in Oman, and two have died. 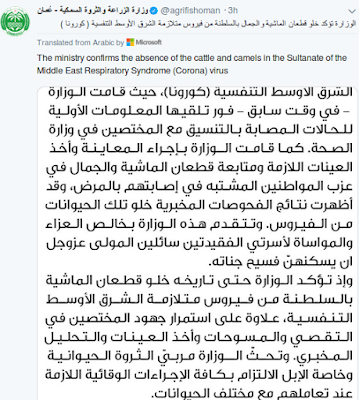 This time it is from the twitter account of the Oman Ministry of Agriculture and Fisheries (MAF), which appears to reassure that local camel herds have been tested for MERS-CoV and are negative for the virus. A (translated) media report (below) - while slightly syntax challenged - appears to reassure that camels in and around where these human cases were detected have been tested, and are negative for the virus. The Ministry of Agriculture and Fisheries in a statement published today on its account in the blogging site "Twitter" that it followed what is being circulated through social media about the presence of human infections with the virus of the Middle East respiratory syndrome (Corona), adding that the Ministry - earlier - immediately received The preliminary information of the infected cases in coordination with specialists in the Ministry of Health, and also conducted the sampling and taking the necessary samples and follow the herds of cattle and camels in the country of citizens suspected of infection, noting that the results of laboratory tests showed the absence of these animals from the virus. The ministry offered sincere condolences and condolences to the families of the two deceased, may Allah be pleased with them. The Ministry also confirmed in its statement that the herds of livestock in the Sultanate are free from the Middle East Respiratory Syndrome virus to date, as well as the continued efforts of specialists in the investigation, surveys, sampling and laboratory analysis. The ministry urged animal breeders, especially camels, to abide by all necessary precautions when dealing with different animals. It is worth noting that six years ago, when camels were first implicated in the carriage and transmission of the MERS virus (see Lancet: Camels Found With Antibodies To MERS-CoV-Like Virus) that antibodies to the MERS coronavirus were detected in all 50 of the dromedary camel samples gathered (from multiple locations) in Oman. Camels, however, only shed the virus (and test positive by PCR) for a few weeks, making the detection of an active infection problematic (see EID Journal: Replication & Shedding Of MERS-CoV In Inoculated Camels). 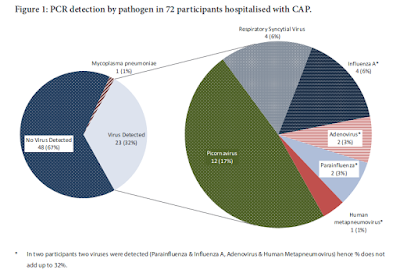 In 2017, in MERS-CoV In Camels: The Gift That Keeps On Giving, we saw a study that demonstrated that camels can be reinfected by the MERS virus, despite having substantial antibody titers. Even so, camels will test negative for the virus for all but a few weeks of their life. So the statement that `herds of livestock in the Sultanate are free from the Middle East Respiratory Syndrome virus' has to be taken both in context and with a grain of salt.